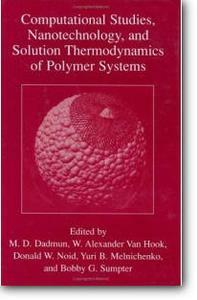 This volume combines two symposia, Computational Polymer Science and Nanotechnology, and Solution Thermodynamics of Polymers, both held at the Southeastern Regional Meeting of the American Chemical Society, October 17-20, 1999, in Knoxville, Tennessee. Both symposia brought together leaders, pioneers, and promising researchers in the area of the physical chemistry of polymers. The first meeting concentrated on computational techniques, while the other presented recent work on both experimental and theoretical works in the physical chemistry of polymers.